This book offers a step-by-step proven system to empower Authors, Speakers, Consultants, Coaches, and Experts to establish your authorities. Learn how to Discover and value your brand, Identify and articulate your brand, . . .
We are around you. Join like our page AND join our groups on these different social media platforms. Download our mobile application form all mobile stores. We are offering an opportunity for you to benefit from all the publicity that will be generated when we launch this book, and provide a way for you to advertise in the book itself and thus put your company directly in front of the readers. 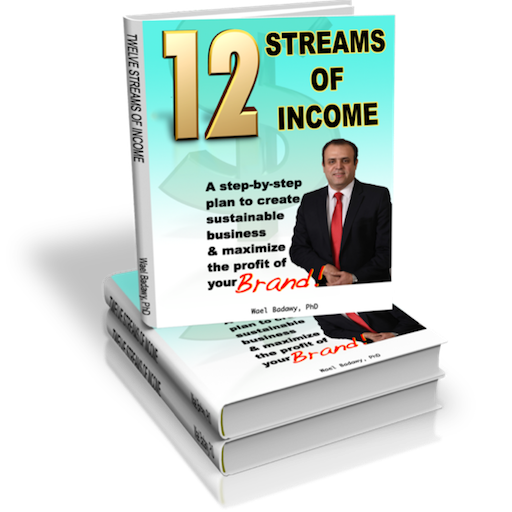 Buy Now and enjoy 30 minutes interview with the author to execute the 12 streams of income strategy. Dr. Badawy is a pioneer and a leader who is devoting his service to help and positively impact our society AND offers a one of its kind service to address the need of Canadian. Dr. Badawy's Mastermind program is second to none; my business has doubled in the few short months I have been in his program and I am projecting similar growth in the 3rd Quarter. I highly recommend his program. Branding blueprints empowered my business and I was able to achieve better result than I planned with Win Your Brand. These workshops and activties are extremely helpful.